Background/Purpose: Compared to ETN, GP2015 has equivalent efficacy, and comparable safety and immunogenicity in patients with chronic plaque-type psoriasis.1 The purpose of this study is to compare the efficacy and safety of GP2015 and ETN and evaluate the effects of switching from ETN to GP2015 in patients with moderate-to-severe rheumatoid arthritis (RA). Methods: EQUIRA was a 48-week, randomized, double-blind, Phase 3, two treatment period confirmatory study. The primary endpoint was equivalent change from baseline (BL) in DAS28-CRP at week 24. Patients ≥18 years with active RA (ACR 1987 or ACR/EULAR 2010 criteria for ≥ 6 months before BL and active disease defined as DAS28-CRP ≥3.2 and CRP >5 mg/L or ESR ≥28 mm/h) and inadequate response to methotrexate (MTX) were randomized 1:1 to 50 mg GP2015 or ETN subcutaneously once weekly for 24 weeks (Treatment period 1 [TP1]). Patients with at least moderate EULAR response at Week 24 either continued GP2015 treatment or, in the ETN group, were switched to receive 50 mg GP2015 up to 48 weeks (Treatment period 2 [TP2]). All patients continued to receive concomitant MTX (10–25 mg/week) at a stable dose and folic acid. Efficacy outcome measures included change in DAS28-CRP, EULAR and ACR20/50/70 responses. Results: Baseline characteristics were comparable between the GP2015 (n=186) and ETN (n=190) groups. 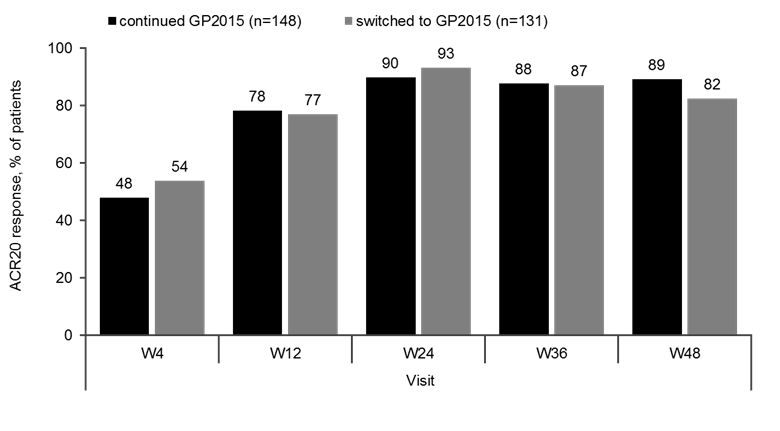 The primary endpoint for equivalence during TP1 was met and previously presented.2 At Week 48, the ACR 20 response rates were comparable between patients who continued on or switched to GP2015 (Figure 1). In TP2, treatment-emergent adverse events (AEs) (Figure 2) occurred in 42.9% vs 38.0% patients with only 13.1% vs. 11.4% considered drug related in the continued GP2015 (n=175) vs the switched (n=166) groups; serious AEs occurred in 2.3% vs 2.4% patients (TP2 safety set). Injection site reactions occurred in 6 (3.6%) patients in the switched group but none in the continued GP2015 group. 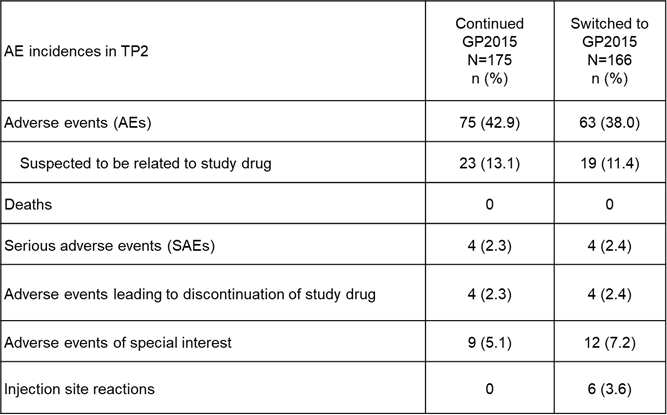 In TP2, four (2.4%) patients in the continued GP2015 group had single-event, very low titer, non-neutralizing antidrug antibodies detected. Conclusion: The efficacy of GP2015 over 48 weeks was comparable to that of ETN. In addition, the switch from ETN to GP2015 did not impact efficacy and safety of etanercept in patients with moderate-to-severe RA. References: 1. Griffiths CEM, et al. Br J Dermatol. 2017;176:928–38; 2. Kavanaugh A, et al. [abstract]. Arthritis Rheumatol. 2017; 69 (suppl 10). Disclosure: A. Kavanaugh, Sandoz, 5,Merck & Co., 5,Boehringer-Ingelheim, 5; M. Matucci-Cerinic, Actelion, 2,Beyer, 2,Bristol-Myers Squibb, 2,Chemomab, 2,Inventiva, 2,Pfizer, Inc., 2,Sandoz, 5; H. Schulze-Koops, None; M. Buch, Pfizer, Eli Lilly, Roche, AbbVIe, Astra Zeneca, Sandoz, UCB, 2,Abbvie, Astra Zeneca, Eli Lilly, Roche, Pfizer, and Sandoz, 5; Y. Allanore, Pfizer, Inc., 2,Sandoz, 2; E. J. Kucharz, AbbVie Inc., 5,Berlin Chemie, 5,Biogen, 5,Celgene Corporation, 5,Egis, 5,Eli Lilly and Co., 5,Merck & Co., 5,Novartis, 5,Pfizer, Inc., 5,Polpharma, 5,Roche, 5,Sandoz, 5,UCB, Inc., 5; G. Babic, Hexal AG, a Sandoz company, 3. Kavanaugh A, Matucci-Cerinic M, Schulze-Koops H, Buch M, Allanore Y, Kucharz EJ, Babic G. Phase 3 Equira 48 Week Study Results Demonstrated No Impact on Efficacy and Safety When Patients with Moderate-to-Severe Rheumatoid Arthritis Were Switched between Reference Etanercept (ETN) and GP2015, an Etanercept Biosimilar [abstract]. Arthritis Rheumatol. 2018; 70 (suppl 10). https://acrabstracts.org/abstract/phase-3-equira-48-week-study-results-demonstrated-no-impact-on-efficacy-and-safety-when-patients-with-moderate-to-severe-rheumatoid-arthritis-were-switched-between-reference-etanercept-etn-and-gp201/. Accessed April 20, 2019.